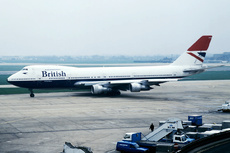 The aircraft was operating from Bahrain to London Heathrow. The First Officer was incapacitated with severe diarrhoea. An autoland was attempted as LHR was operating LVP's. On the latter stages of the approach the aircraft became unstabe on the localiser and the ILS Deviation lights illuminated. During a Cat. II runway 27R ILS approach the pilot had difficulty getting the autopilot to lock on to the ILS. At that time the aircraft had deviated to the right off the runway 27R centreline. A go-around was carried out and the aircraft cleared the Penta Hotel on the A4 Bath Road (which runs parallel to the north side of Heathrow Airport) by just about 12 feet/3.5m. According to the Daily Telegraph at the time G-AWNO "....came so low that car alarms were set off in the car park"
"I remember that one: I was on the 90 bus going to work from Feltham to Hayes, and the bus was at the bus stop between the perimeter road and the A4. Cloud base was very low and I remember the horrible noise of engines being throttled up and seeing the 747 passing over the bus with the thrust rocking the bus, it sure was low as it came over there, the building at the side of the bus was a BT telephone exchange if I remember rightly. Thank god he throttled up when he did or is would have been one hell of a mess." As a result of this incident the rules on landing and approach for the Boeing 747-100/200 were changed to make a manual go-around mandatory if the ILS Deviation lights illuminated at any stage on the approach.